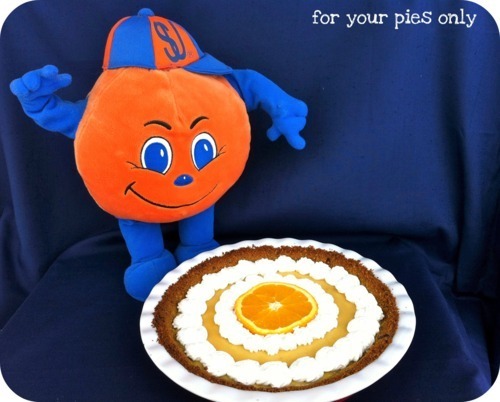 You may be wondering who this smiley, orange and blue guy is and why he’s muscling in on my photo of this Orange Creamsicle Pie. He’s Otto the Orange, mascot to Syracuse University. Why is he on the blog today? Well, for one…I live in Syracuse, NY…aka “Orange Country”, and because SU is my alma mater, AND because tonight the SU Orangemen’s basketball team play tonight against the Pittsburgh Panthers. Orange fans will be avidly watching to see if SU will win, making a new record for opening the season at an undefeated 20-0! 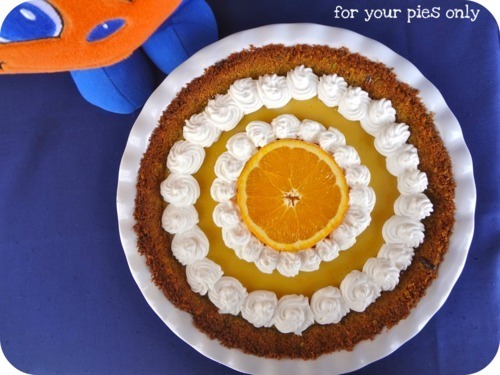 Amidst the snow and cold, I am hoping this bright and sunny Orange Creamsicle Pie will bring us some luck. As an added bonus, I used my brand-new-never-owned-one-in-my-life-until-now food processor to make the pistachio graham cracker crust. The pain of hand-shelling those pesky pistachos was totally worth the 10 seconds of blitzing the crap out of them in the food processor. Seriously. Preheat oven to 350. Lightly butter your pie pan. Combine nuts, brown sugar, and flour in a food processor and process until the nuts are finely chopped. Dump mixture into a large bowl and stir in graham cracker crumbs, cinnamon, and salt. Add melted butter and mix until you can press the crumbs together in clumps. Press into buttered pie pan and place in fridge for 5-10 minutes. Bake for 7 minutes and take out of the oven to cool while you prepare the filling. Bring orange juice to a rapid boil in a medium size saucepan. Turn heat down and continue to boil until reduced to 2/3 cup (yes, this could take a little while…keep a heat proof measuring cup to track progress). Let cool slightly in a separate bowl. Beat together condensed milk, egg yolks, lime juice, vanilla, and orange zest in a large bowl. Beat in reduced orange juice until evenly blended. Pour filling in the cooled pie shell. Bake at 350 for 20 minutes. Remove from oven and allow to cool on a wire rack. Refrigerate for 4 hours or overnight (I choose overnight). Decorate with whipped cream, orange slices, orange peels, whatever you’d like!